In April I had the unparalleled pleasure of speaking with Dita Von Teese about her upcoming West Coast tour, her dazzling co-stars, the merits of dressage, and the peculiar momentum one needs when wearing a gown encrusted with Swarovski crystals. Those who follow Dita’s career closely may already have a sense of her audacious spirit and industriousness, but she also maintains an unfailing sense of community. What struck me most about talking with Dita was the connection she maintains with not only the burlesque community at large, but with the purest aspect of her career – live performance. Charming and quick to laugh, she makes no secret of her self-made glamour or her roots in strip and fetish modeling. Dita possesses a lightness balanced with an admirable, unshakeable sense of self. All this, and she’s beautiful, too. Dita performing in Strip Strip Hooray! in LA earlier this month. ©Kaylin Idora - Not to be used without permission. First off, congrats on your West Coast tour! Can you tell us a little about how Burlesque: Strip Strip Hooray! originated? Thank you! Well, I’ve been wanting to do a full length revue for a while now, because I’ve spent a lot of time guest starring – at the Crazy Horse in Paris, or in a few different shows in Europe – and I get hired a lot for private events and things like that, but for a while I’ve really wanted to do my own show where people can come to see me [laughs] and get a chance to see all my biggest production numbers in one show. There’s something different when it’s an audience of fans, real fans. It’s different – a different feeling, a different vibe. I was going to ask you about that actually. In doing live burlesque, as opposed to photo shoots or fashion shows, do you find that you have to call on a different part of your personality and switch gears a little? Oh for sure, definitely. I guess it always depends on your mood but I always just feel like it’s what I’m really meant to do. It’s fun doing photo shoots, but not really all the time. Sometimes it’s a little like I’d really like to be doing my real job, you know – probably like actors that don’t want to sit there and do interviews all day; they’d like to go act and do what they do – what they’re supposed to be doing – instead of just talking about what they do. So, you know, photo shoots can be very glamorous and really exciting and creative, but for me there’s nothing that I like doing more than performing these shows that I’ve spent so much time and energy and money creating. It’s like baring my heart and soul up there and it’s a lot different than a photo shoot or someone else’s vision of what they want me to do. Has the show evolved since the southern and LA dates you did in 2011? Yes, in the past we’ve done a few different dates, and we were really trying to find the perfect combination of support talent – between making sure that every act is a showstopper and every act is really wonderful – but also people that are really great together. I like working with really wonderful people that are easy to work with and fun, and people that I admire. I think it was about really refining the cast to make a really great, diverse line up. I wanted to feel like people can watch the show and see someone that maybe they can relate to a little bit. So that was important to me. For this show we have the support of Live Nation, and it’s been really great to have them behind us to figure out how we can make this big production a success, and at the same time try to keep the ticket prices attainable. (Because you know, our ticket prices start at $35.00, and it’s a lot of show for $35.00!) It’s not easy to do this. So this show is really the fleshed out version. The perfected version of what you saw before. Dita performing The Opium Den in Strip Strip Hooray! in LA earlier this month. ©Kaylin Idora - Not to be used without permission. You’ve worked with every one of your co-stars previously. Although the eight of you are very different (some classic, some comic, some racy), the common thread seems to be a fearlessness and confidence, traits which you possess yourself. Can you explain how you chose your cast for this tour, and why these performers appealed to you? Well, I’m really excited to have added to the cast Catherine D’Lish, who is one of my closest friends, if not my very closest friend. Not only is she a wonderful performer and a close friend of mine, but a lot of people remember that we used to do a lot of shows together. Even the first time I did my martini glass act it was part of a duo act between me and Catherine, where she was in a giant champagne glass and I was in the martini. So we’ve been partnering up for a long time and also she’s responsible for three of the four costumes that I wear in the show. We’ve always worked together on a lot of these shows. I’m really proud to have her in the cast now. Dirty Martini, who is a legend in the burlesque scene and a major star in her own right, for me really represents the beauty of voluptuousness and brings the house down every single time. And we also have Perle Noire, who is an astonishing energy. I’ve never seen anyone with this much energy in burlesque. She just brings a really special quality to the show that I love. We have Selene Luna who a lot of people know is also a great comedienne that does a really wonderful show. She’s amazing. We have a girl named Lada. Lada is one of the great stars of the Crazy Horse in Paris, and I came to know her from working at the Crazy Horse, and I just thought she was one of the best, most amazing women I’d ever seen in my life; an incredible dancer and an amazing beauty. We are lucky to have her there to represent the Parisian cabaret Crazy Horse. We have a wonderful ‘boylesque’ performer named Monsieur Romeo who I’m just crazy about, he’s also French. (Well, Lada is not French; she’s Russian, in fact, but representing Crazy Horse Paris). Monsieur Romeo – for me, his act is one of the chicest boylesque shows I’ve ever seen. I’m really happy to have him in the show. And Murray! I couldn’t do this show without Murray Hill. First of all Murray and I have a great chemistry. He took me out on a date in New York recently [laughs]. Murray kills it; Murray slays the audience. People can’t stop talking about Murray Hill after they see him. What I love is that he brings that classic, comedic burlesque thing into a new dimension that is great now. Because some of that comedy, if we were just doing a replica of a burlesque show from back in the old days, it wouldn’t be right, or the same. It wouldn’t bring the kind of laughs that Murray gets. 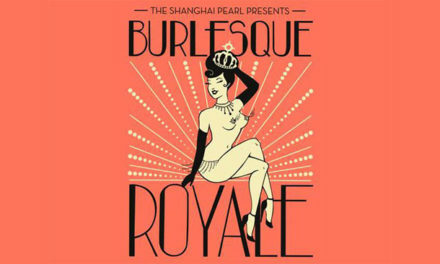 That’s what I think is great about this burlesque show – it’s not a replica and nobody has ever seen a burlesque show like this before, ever. I can guarantee it. I’m really excited for people who follow burlesque, all of these people are legends.